I'd subbed this to a few literary agents years ago, too, and had some interest but no real takers. 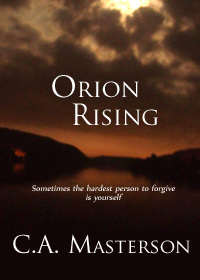 I finally decided to take advantage of the ability to self-publish, and put it out there myself. I'm so grateful to my wonderful niece, Meg Eubank, for allowing me to use that amazing photo for the cover. Love ya, Meg! This 94k novel is a bit different in that it's told through three points of view of three siblings as they struggle with the death of their youngest brother. So, while I don't expect it to take the literary world by storm, I do hope readers will love it as much as I do. It costs only $20 per person to attend this one-day conference, which includes a buffet lunch. An incredible bargain! Come to the Cleve J. Fredricksen Library at 100 North 19th Street in Camp Hill tonight for the launch of A Community of Writers: A Collection of Short Stories. All proceeds from sales of this collection will benefit the Cleve J. Fredericksen Library in Camp Hill, Pa., which sponsored the Natalie J. Craumer Writers Workshops I attended with a really great group of authors. The library offered the workshops at no charge, thanks to the support of husband of the late Natalie J. Craumer, who instituted the workshops to honor his wife's memory. I'm happy to give back to the workshop by contributing two stories. 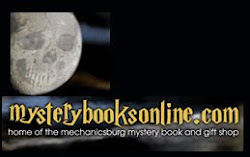 I hope the anthology hits the bestseller lists to keep this great program going! If you'd like to see pics of the event, I've posted some on my blog. The Susquehanna Writers are a well-rounded bunch, with talents that stretch beyond putting words on a page or screen. This weekend, they are well-represented at The 25th Annual Pennwriters Conference, where they are sharing their talents by offering writing workshops. 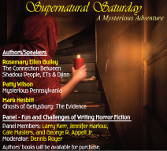 And, as an attendee (and fellow Susquehanna Writer), I wanted to spread the word. I arrived too late to hear Mike Sylvestri (aka "Captain Analog") ease our technology fears, but I got to hear presentations by Laurie Edwards and Jon Sprunk. Laurie shed new light on backstory, and Jon got me revved up to try a new approach in my writing planning. He said he was a novice presenter, but it sure didn't seem that way. Tomorrow, Lori Myers will help attendees put PIZAZZ into their literary readings, and Don Helin will keep things moving in a workshop on pacing. 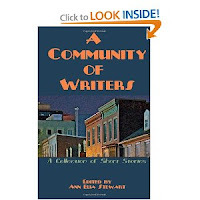 These authors are a testimony to the fact that the writing community is made up of talented people who give back by sharing their knowledge with other writers. Pretty amazing in what can be a very competitive field. 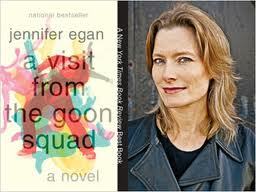 Jennifer Egan visited Carlisle a few weeks ago, and read the first chapter of her Pulitzer-winner, A Visit From the Goon Squad. I was thrilled she came to town. I don't know how Dickinson manages to book such amazing authors as her, Ian McEwan and Margaret Atwood, among others. And to make the events free to the public (exactly what I can afford). Afterward, during the brief Q &A session (extremely regimented, actually - only five questions allowed), someone asked how she came up with the title. Great question. It's not exactly a grabber of a title, except for its oddness. Ms. Egan expained she had come up with the title before the story. Each story that she began, she wondered, is this, finally, A Visit From the Goon Squad? At some point while writing it, a line of dialogue made her realize that her WIP was, indeed, the long awaited A Visit From the Goon Squad. After publication, the story didn't sell well at first. She kicked herself for giving the book that title. But then, of course, it was nominated for a Pulitzer, boosting sales, and then awarded the Pulitzer, and the rest is bestseller history. It surprised me that Ms. Egan suffered from such insecurities, being such an established author. Another surprise was the basis for the story - sparked from a real-life incident in which a woman left her purse, with wallet in full view, on the sink in a public rest room while she used the toilet. Crazy, but true. But I found it reassuring that a well-known author did this, as I've done it myself and felt like I'm pilfering, or my muse hasn't quite done her job well enough. Funny story, though - Ms. Egan told how her own wallet had been stolen more times than she could recall, and had received a call from the credit card representative soon after her card was stolen. Ms. Egan shared more information with the woman only to learn that she was, in fact, the thief herself.